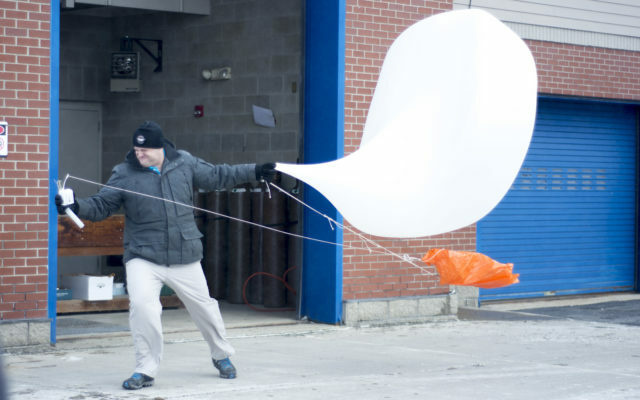 CARIBOU, Maine — Intense wind, snow, and temperatures did nothing to hinder a collaboration among researchers and students from the Caribou National Weather Service, Caribou High School, the University of Maine at Presque Isle, and City College of New York during the launch of a weather balloon on Thursday. Tod Foisy of the Caribou NWS Science Operations office showed students and CCNY delegates how the weather balloon is inflated, and explained how it collects data from above before all ventured into the harsh winds to witness the launch. Reza Khanbilvardi, director of the NOAA-CREST (National Oceanic and Atmospheric Administration Cooperative Science Center for Earth System Sciences and Remote Sensing Technologies) center at CCNY, also showed students the CREST-SAFE (Snow Analysis and Field Experiment) site located just outside the Caribou NWS office. The CREST-SAFE site is one of four in the country, and was established in 2010. The $1 million facility, funded by the New York state government and federal agencies, collects long-term microwave and surface observations of snow during dry, wet, and melting snow conditions in real-time. City College of New York President Vince Boudreau said he was excited to venture north and witness the collaboration of local scientists, high school students, and UMPI college students. “A core aspect of the NOAA-CREST mission is to go out with young men, women, boys, and girls and let them know that this science is, number one, important to their lives and, number two, that it is an educational pathway they can take,” Boudreau said. Two of the UMPI students who participated are Caribou High School graduates, and Boudreau said their presence helped relay the message that this is a field that anyone can pursue. Khanbilvardi said the Caribou center is one of four in the country, and is unique in that it is focused on making measurements related to snow. Shakila Merchant, assistant director of the NOAA-CREST center said the reason CCNY decided to do community engagement in The County is to show how science can be used to predict weather extremes anywhere in the country, and also to work with the Aroostook Band of Micmacs, who have been collaborating with CCNY since 2016 and hosted the group during their stay. In closing, Boudreau said it was a “tremendously exciting” experience to visit the NOAA-CREST site in Caribou for the first time.